Last week I finished my 20th year of teaching, and my first year of teaching kindergarten. Every year I learn many, many things to layer onto my learning and growing as a teacher. Who I am as a teacher is a rich tapestry of 20 years of students, colleagues, parents and experiences. Here is a list of the lessons learned this year. 1. Read. You can never read too many books. I filled our days with read alouds and exposed my kids to many authors and genres. The last week of school we reflected on our favorite books. The conversation was long and spirited as we discussed favorite authors and books. We finally came to the conclusion that it’s impossible to have just one favorite. I love that my kindergarteners are going into first grade with long lists of favorite authors and titles. They cherish books as much as I do. I hope this stays with them for many years. 2. Laugh. You can never laugh too much. Teaching can be stressful and teaching 20+ 4 and 5 year olds can be like herding cats. But we always have a choice – to allow ourselves to get stressed and upset or to step back and find some humor in the situation. I learned a lot from my little friends this year about how to see the joy and laughter in a situation instead of allowing the stress to get the best of me. 3. Play. Never underestimate the power of play. I learned so much about each of my kids by observing and joining them in play. There is nothing that could be more beneficial than the Explore time we have at the beginning and end of each day. 4. Slow down. Kindergarten has taught me that everything will take at least twice as long as I’ve planned for it to take. And I finally embraced that. Next year I will really focus on planning less and not feeling rushed or pressured to move through things quickly. Slowing down lets me be more present for my students and to enjoy the moments more as well. 5. Talk more. In a classroom with the majority of children learning English for the first time, developing oral language is key. Encouraging talk during play, writing, reading, math, morning meeting, science, social studies, and throughout our day allowed all children to greatly increase their language. Talking was how we solved problems, negotiated our curriculum, built our relationships and got to know each other in our community of learners. A kindergarten classroom is never quiet. And that’s OK.
6. Talk less. This one is big for me. I tend to talk too much. I still do. But I’m working on listening more and talking less. I am trying to focus my instructions, explanations, etc. and get to the point right away. Kids tune out after a few short seconds and I’m aware of that and working at being more concise. When I talk less, it gives them more time to talk, play and learn! 7. Play. (yes, I realize I have this twice – it’s that important) Some people reply to my telling them I teach kindergarten with a “how cute – you get to play all day!” While I despise the “cute” word, it is true, I do get to play all day. And by play I am talking about all kinds of play – imaginative play, dramatic play, purposeful playful learning, authentic play, inquiry based play and discovery play. Play that goes way beyond the traditional definition of play. I do want my kids to view making books, reading, and math workshop as play. Play is fun and learning should be fun too! I embrace the word “play” in our classroom and realize that a lot of adults need to understand what “play” looks like in our classrooms and how critical play is to learning. And while we may “play” all day – it’s through play that we learn, grow, build a solid foundation of academic and social learning and inspire a love of learning. 8. Build a community. While I’ve known for quite some time how important a strong community is, this year reminded me once again that it’s the glue that holds us all together. Our classroom community sets the stage for all the learning that occurs throughout the year. But it’s also the community that is built within our teams and our schools. I had the privilege of working with a phenomenal team this year. Sharing your days with like-minded, passionate and caring educators makes coming to school every day a joyful experience. I realize and appreciate how lucky I am to have this. Kindergarten is my happy place. It’s where I need to be as a teacher. Having been a teacher in grades 1-8, a literacy specialist and a librarian – I’ve finally found my home in kindergarten. I thank each of my students and my colleagues for helping me see that and for giving me so much to learn from this year. What did your students teach you this year? This coming year will be my first in K (as an ESL teacher). This post helped my nerves some! Are you on Twitter? If so, I recommend following the #kinderchat hashtag. It is an AMAZING network of committed, passionate kindergarten teachers. They helped me SO much in my first year of K. Best of luck! My class blog is http://katiekeier.edublogs.org/ if you’re interested in checking that out. I do it with my students throughout the year, but I will be keeping it up during the summer too. Thanks for your comment! I completely agree! 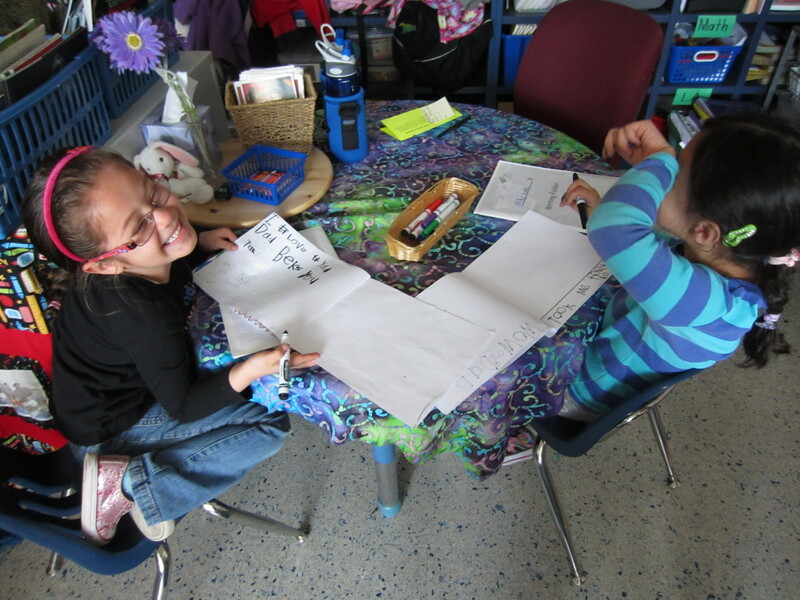 Much of what we do in kindergarten is just as important in the upper grades. I loved what my colleagues did with introducing Explore in 5th grade. They are still kids – and need to play! Thanks for your comment!